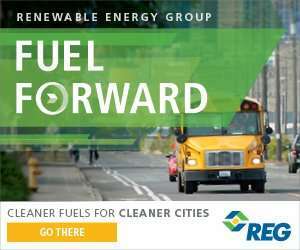 Drivers heading down Louisiana's interstate corridors will soon see signs advertising fueling stations with alternative fuels along their commute. In 2018, Louisiana submitted a proposal to the FHWA to have Alternative Fuels Corridor signage installed along our interstate highways. Louisiana Department of Environmental Quality says in their March 2019 newsletter, “LDEQ worked closely with Louisiana Clean Fuels and Capitol Region Planning Commission to complete the states’ proposal to the Federal Highway Administration (FHWA). 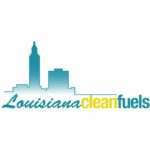 LDEQ is proud to announce Louisiana now joins 34 other states where the FHWA has approved Alternative Fuels Corridors. FHWA and participating states hope the Alternative Fuel Corridors will bring together stakeholders like state agencies, utilities, alternative fuel providers and car manufacturers to promote the advancement and use of alternative fuels.” Multiple corridors have been approved for signage for the following fuels in Louisiana: compressed natural gas (CNG), liquified natural gas (LNG), and liquified propane gas (LPG). 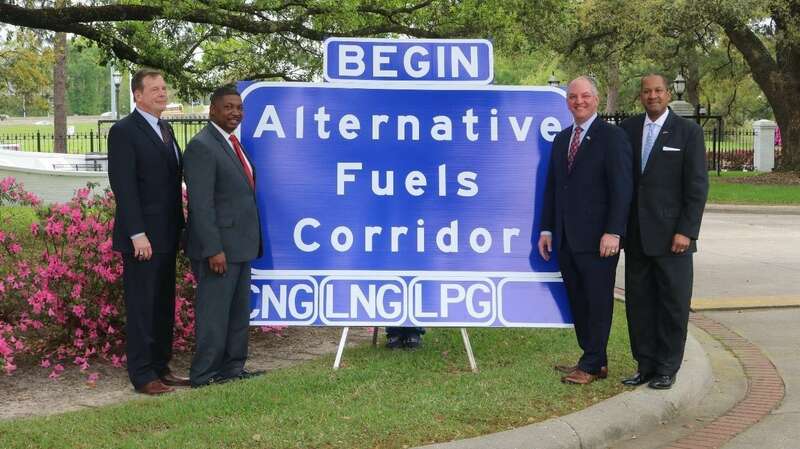 On March 18, 2019, Louisiana Governor John Bel Edwards posed with several cabinet members in front of one of the new Alternative Fuel Corridor signs to celebrate their coming installation. The signs will be installed along interstates I-10, I-20, and I-49 to mark fueling locations for propane, LNG, and CNG. Having signs along Louisiana’s interstates will enable drivers to quickly and easily locate fueling stations for alternative fuels. 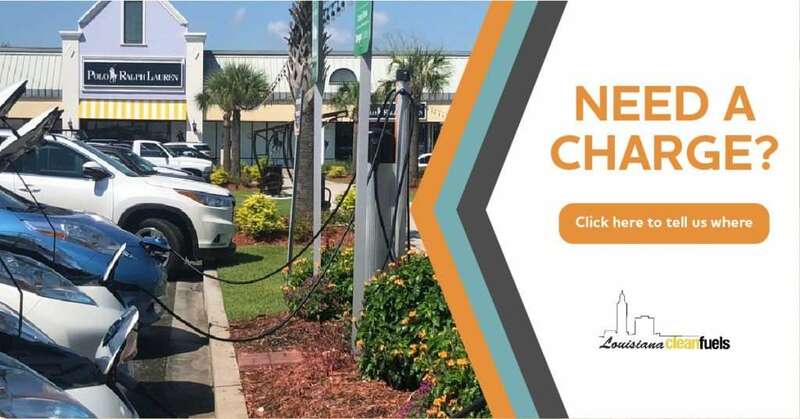 Though Louisiana has not yet been approved for electric vehicle charging signage, LCF is currently working on a DC Fast Charger Master Plan to propose locations for DC Fast Chargers along Louisiana’s interstates with the aim of establishing an EV charging corridor and adding EV signage to our alternative fuel corridor signage. Currently, there are only 3 DC Fast Charger in the state of Louisiana that are not Tesla-exclusive. Under the FHWA guidelines, DC Fast Chargers must be spaced a maximum of 50 miles apart, each within 5 miles of the interstate in order for the corridor to be eligible for signage. Moving forward, LCF is excited to see the progress Louisiana has made in recognizing and encouraging the use of cleaner fuel options in our state’s transportation. LCF’s mission includes a commitment to supporting local actions to diversify transportation fuel options in the name of advancing the nation’s environmental, economic, and energy security, and the establishment of an alternative fuels corridor with corresponding signage is a major step in the direction of that diversification. To learn more about the establishment of the alternative fuels corridors, see our FHWA Alternative Fuel Corridors page. 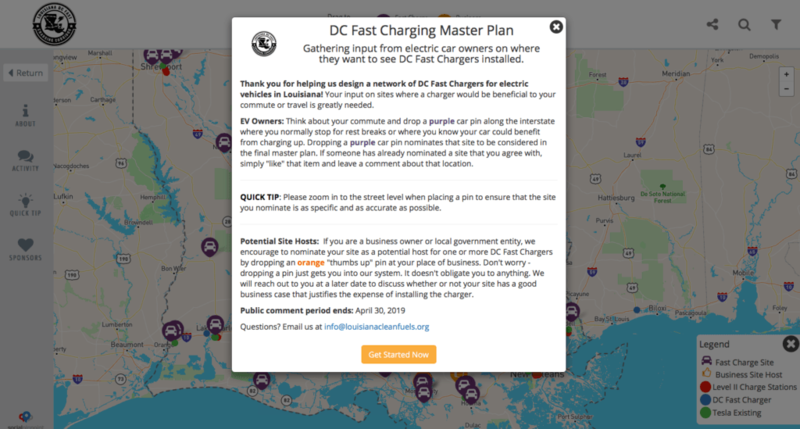 To take part in the decision-making process on where to place DC Fast Chargers along Louisiana’s interstate corridors, see our DC Fast Charging Corridor page. Why should my fleet switch to alternative fuels now?